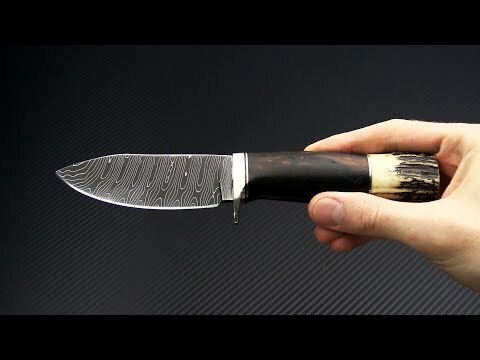 The Burr Oak Custom Hunter is a striking full custom fixed blade knife handmade by Mark Nevling. The Hunter is a visual masterpiece that is built robust enough for serious outdoor use. This piece is made from a Bold Twist pattern carbon steel Damascus blade with a Stag pommel and Desert Ironwood handles with nickel silver spacers and guard. Brand new direct from maker. Blade: The Hunter comes with a skinner style blade with a subtle Nessmuk hump on the spine. The blade is flat ground and all belly, optimal as a hunting and skinning blade. The carbon Damascus is tough and takes a razor sharp edge for easy maintenance in the field. Handle: The handle is essentially two parts: a large and rugged Stag pommel and a smooth desert Ironwood handle framed by nickel silver spacers. The neutral handle design in comfortable in nearly any grip and well balanced for extended use. A large, polished nickel silver finger guard keeps your fingers safe from the blade during use. Sheath: Carries via hand stitched leather belt sheath with 3D Tooling. Includes padded zipper pouch for storage and signed certificate of authenticity.